The return of Game of Thrones topped Pay TV viewing in Australia yesterday, screening across multiple broadcasts. The “Winterfell” episode played 7 times on FOX Showcase (not including FOX Showcase +2). Comparing with 2017 S7 premiere is difficult… that drew 447,000 for its daytime broadcast and 352,000 for the primetime replay, at 799,000 viewers. So the 2019 audience is up 17% with extra playouts. There were also big audiences through Foxtel Go and Foxtel Now platforms, which reflects the changing ways that viewers access content. Yesterday it drew 273,000 via Foxtel GO / Now, up 618% on Ep 1 of S7 (38,400). Together with On Demand that figure rises to 333,000 -the highest single day VPM number on OzTAM this year, including Married at First Sight on Free to Air. Brian Walsh, Foxtel’s Executive Director of Television said, “The Wall may have fallen but last night’s ratings have rocketed Game of Thrones higher than ever as Australia joined the rest of the world in watching this global television event in numbers never before seen on Foxtel. 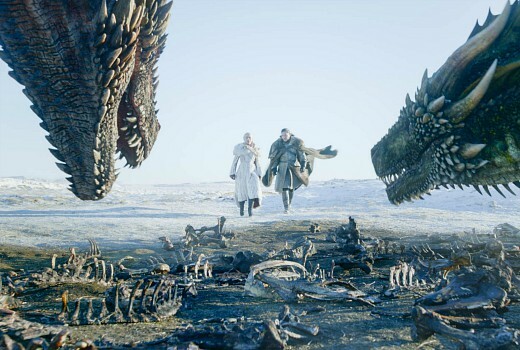 Yesterday’s viewership is a testament to the hunger that fans have had over the past two years for the return of the unrivalled action, drama and intrigue that only Game of Thrones can deliver and we are thrilled with the result. Frankly there is no other show like it. It is the television series of a generation. In the US the numbers were also massive. The hit series was again the target of piracy, with TorrentFreak reporting over 120,000 BitTorrent users were actively sharing copies of the episode, and that’s just the tip of the iceberg. The first episode came out a few hours early for some people on DirectTV Now, adding to the long history of leaks. Torrent sites used to be the main distribution platforms for pirated TV shows, but unauthorised streaming sites are much more popular today. This show is an absolute juggernaut.What will Foxtel do without it,I wonder?They don’t anything else that even approaches its popularity. We took a step back and re-watched the last episode of season 7 before going straight into ‘Winterfell’. It was a glorious couple of hours. It’s baffling, just baffling to me that FTA networks have never picked up GoT, not even for a delayed broadcast. In 2015, I was shocked that Turkey was fast-tracking GoT on FTA, and considering how bizarre their censorship laws are, I can’t imagine that the network would have had much time to censor the episodes in time for broadcast. Not baffling at all. It is not offered to them. Foxtel exclusive. I wasn’t sure what the licensing conditions were regarding Game of Thrones in Australia, so cheers for clarifying that. There have been examples of Pay TV content being broadcast after their initial broadcast on FTA, such as The Walking Dead on SBS and Breaking Bad on ABC (though these shows are arguably limited in their appeal). I just find it odd that the option to at least “slow-track” Game of Thrones in a similar manner hasn’t been offered to the FTA broadcasters, but perhaps Foxtel consider it a big enough selling point they may be reluctant to risk jeopardising that. I think Foxtel has an exclusive deal with HBO at the moment, I think 9 has the rights to the sopranos for the first few seasons. It would be nice to see some reruns of hbo shows on FTA. The syndication rights to friends earns the studio about $1 billion a year and opened the show to a new audience who didn’t see it when it originally aired. Shows like the wire, the sopranos, veep, silicon valley, curb your enthusiasm and game of thrones could probably get decent number on fta multi channels, 7mate, go!, etc. When HBO was on free to air it just kept being dumped late at night and removed without warning. I agree with you about some of that but anybody who wanted to see The Wire would own it already/it has a seasonal binge scope.